Members of Temple B’nai Abraham gather outside a wall of the Warsaw Ghetto. 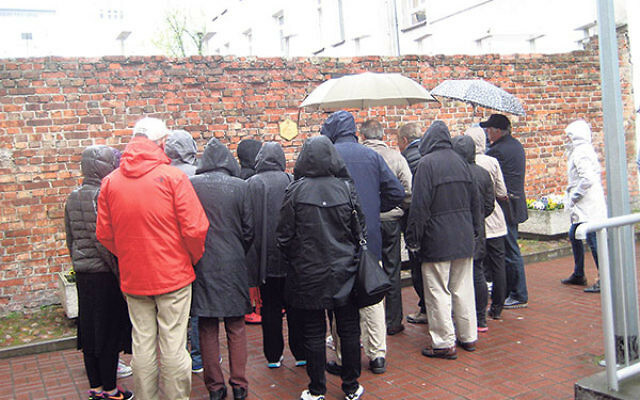 From April 24 to May 3 they toured what Kulwin labeled “three centers of Nazi terror” — Cracow, Prague, and Berlin. Their trip began with a visit to Cracow’s Wieliczka Salt Mine, where several thousand Jews who had been shipped from slave labor camps in Plaszow and Mielec were forced to toil in the underground munitions factory. A day later the group toured the city’s one-time ghetto, several of its synagogues, and the enamel factory owned by Oskar Schindler, the Nazi Party member who employed some 1,000 Jews, managing to save them from extermination and whose rescue efforts were the basis of the book and movie Schindler’s List. In Prague, museums and cemeteries were major stops on the schedule, along with a walking tour of the ancient Jewish quarter and a bus trip to the nearby site of the Theresienstadt ghetto and concentration camp. After a flight to Berlin, the group had Shabbat dinner at the city’s Synagoge Pestalozzistrasse, where Rabbi Joachim Prinz, a leader in the American civil rights struggle and a predecessor of Kulwin as B’nai Abraham’s religious leader, had conducted services before fleeing Nazi Germany. The following morning the group returned there for Yizkor services.